Smokey Look must be one of my favorite makeup application. I completely adore Georgina's eye looks on Gossip Girl that it has been my wish to properly learn this very famous eye makeup application. For years, celebrity has strutted sported this look. And every makeup artist must have their own version of attaining this eye-defining look. 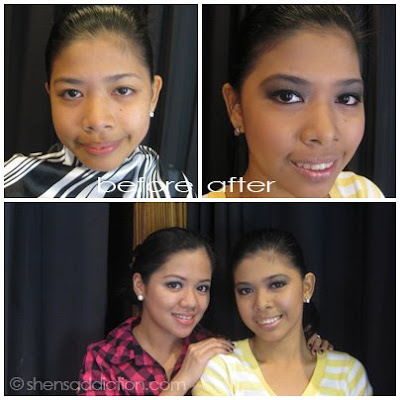 Ms. Cheryl taught us the basic way to achieve the one-tone smokey eyes, using only a black eyeshadow and black eyeliner. Simple right? With practice, yes. Although I must admit that I had a difficult time blending the black eyeshadow without making it look dirty or giving my model a halloween look. LOL! I only used one eyeshadow flat brush to create this look! I'm not scared to waterline eyes anymore no matter how difficult it is to do on others. 1. There is no reason to buy new makeups to achieve this look. I only had to look at my stash to see that I have all that I need. So I suggest that before you invest on expensive makeups, see if you already have the necessary things in your makeup kit before splurging. I relied on the black eyeshadow of my 28 pc. Neutral Palette to create the smokey eyes seen above. While I used the 10 pc. 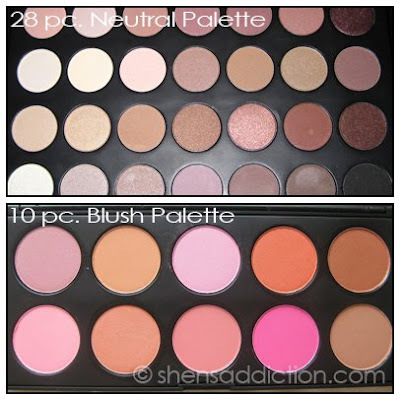 Blush Pallette to give glow to my model's cheeks. As for the eyeliner, I used my MAC Ebony eyeliner I got from the Fafi Collection. The false eyelashes are bought inexpensively from Landmark Department Store. It's a very liberating experience when all your doubts are set aside. That's how I feel everyday I attended this class.